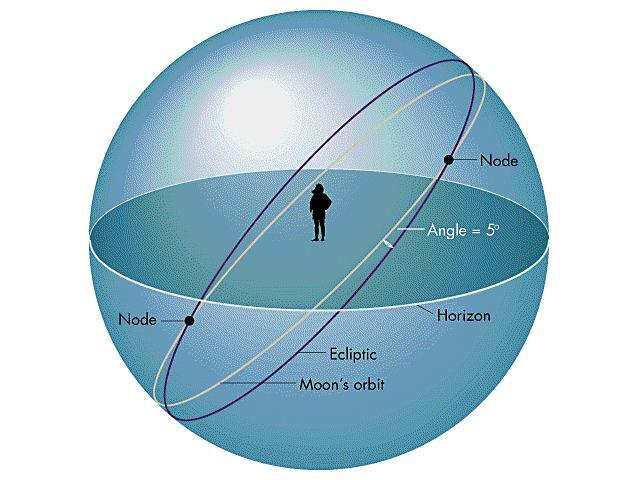 Astronomers base their measurement of positions of objects on the concept of the celestial sphere upon which all objects are assumed to lie regardless of their true distances. 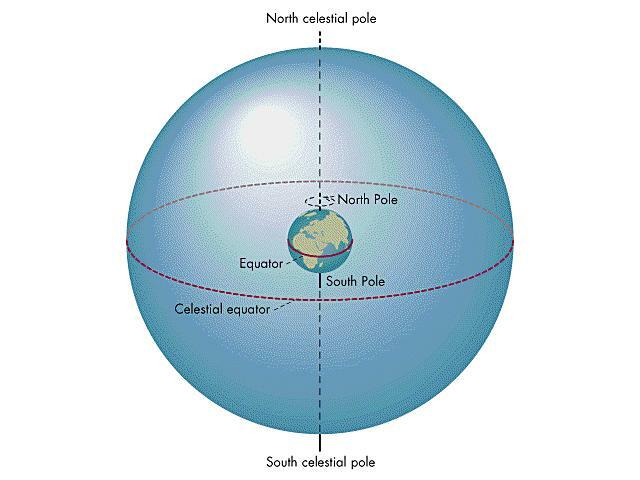 The celestial poles and equator are the projections of the Earth's poles and equator onto the sky. The meridian is the circle running from one pole to the other through a point directly overhead for an observer. The point directly overhead is called the zenith (and the point 180º away is called the nadir). Equatorial coordinates: An Earth-based system useful for pointing telescopes with axes that are parallel to the Earth's polar axis and equator (called equatorial mount telescopes). This system was the first used in compiling stellar catalogues, and the two coordinates used to define the location of an object, right ascension (abbreviated often as or RA ) and declination ( or DEC), are in common use today. Right ascension is analogous to longitude, is usually measured in units of time: hours, minutes, seconds. The zero-point for right ascension is the Vernal Equinox (also called the Aries Point in the text), location on the celestial equator of sunrise on the first day of spring. The total range of right ascension is 24 hrs = 360 deg / 15 deg/hr. The 15 deg/hr conversion factor arises from the rotation rate of the Earth. Declination is analogous to latitude and is measured as north or south of the celestial equator. Declination is usually expressed in degrees, minutes of arc, and seconds of arc. 1 degree = 1 º = 60 arc minutes = 60' = 3600 arc seconds = 3600"
Note that because right ascension is measured in time units, before performing calculations you need to multiply by 15 degrees/hr. Another complication with right ascension arises from the changing angular size of circles of constant right ascension when moving from the celestial equator towards the celestial pole, the circles shrink by a factor of cos(DEC) which must be taken into account. It is very important to keep minutes of time and arc minutes clear! Examples: A star on the celestial equator with right ascension 6 hrs lies 6 hrs x 15 deg/hr = 90 degrees from the Vernal equinox. A star at 60 deg declination and right ascension 6 hrs lies 6hrs x 15 deg/hr x cos(60) = 45 degrees from a point at 60 deg declination and 0 hrs right ascension. If the H.A. for an object is negative, it lies east of the meridian and will cross the meridian, reaching its highest point in the sky, when the sidereal time equals its right ascension. 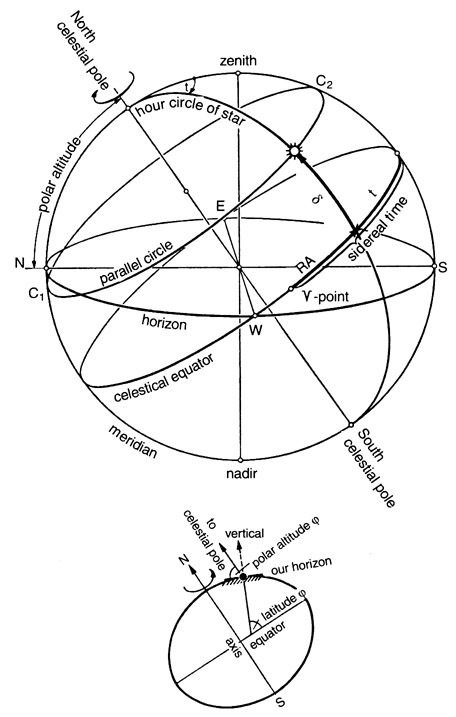 This illustrates how the equatorial system accounts for the rotation of the Earth and explains why early astronomers chose to use time units for right ascension. In addition to RA and DEC, astronomers use a number of other coordinate systems depending on the circumstances. Coordinates based on a telescope's location can be advantageous as can coordinates based on the plane of the Solar System or on the plane of the Milky Way galaxy. Spherical trigonometry is handy for converting between coordinates systems. (Figure 2.3 from the text). The Earth's rotation is used a basic unit of time measure -- the day. If you keep track of the intervals between successive times of maximum elevation of the Sun above the horizon (e.g. noon), you will discover a complicated pattern with the differences between these intervals and an average day called the equation of time. These differences result from two causes -- first, we measure time with respect to the Earth's rotation axis and hence equator while the Sun's motion is along the ecliptic, and second, the Earth's orbit is elliptical and the Earth moves faster along its orbit when closer to the Sun. Seasons result from the 23.5º inclination of the Earth's polar axis with respect to the plane of the Earth's motion around the Sun (called the ecliptic). The polar axis points in an invariant* direction in space so that for example, the north pole alternately points towards the Sun (summer) or away from the Sun (winter). The seasons are obviously opposite in the Earth's two hemispheres. *Not strictly invariant -- remember precession! 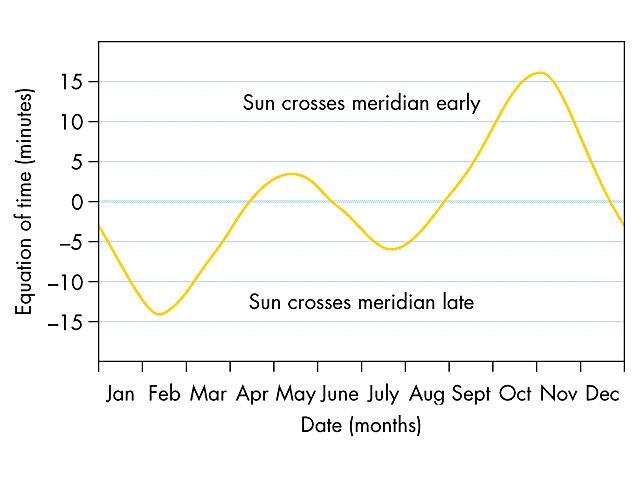 The polar direction is slowly changing due to precession (direction takes 26,000 yrs to complete one circuit) but the angle between the polar axis and the ecliptic is fixed and invariant. We also tend to identify various constellations with the seasons because the stars visible at night change throughout the year. 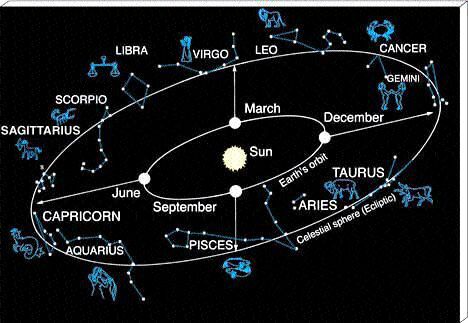 The ecliptic passes through the constellations of the zodiac. The Moon takes ~28 days to orbit the Earth with the time ranging from 27.32 days if measured with respect to the stars (sidereal month) or 29.53 days if measured with respect to the Sun (synodic month). The phases of the moon repeat with a month time scale as the Moon orbits the Earth. Astrometry: the science of measuring stellar positions very accurately. 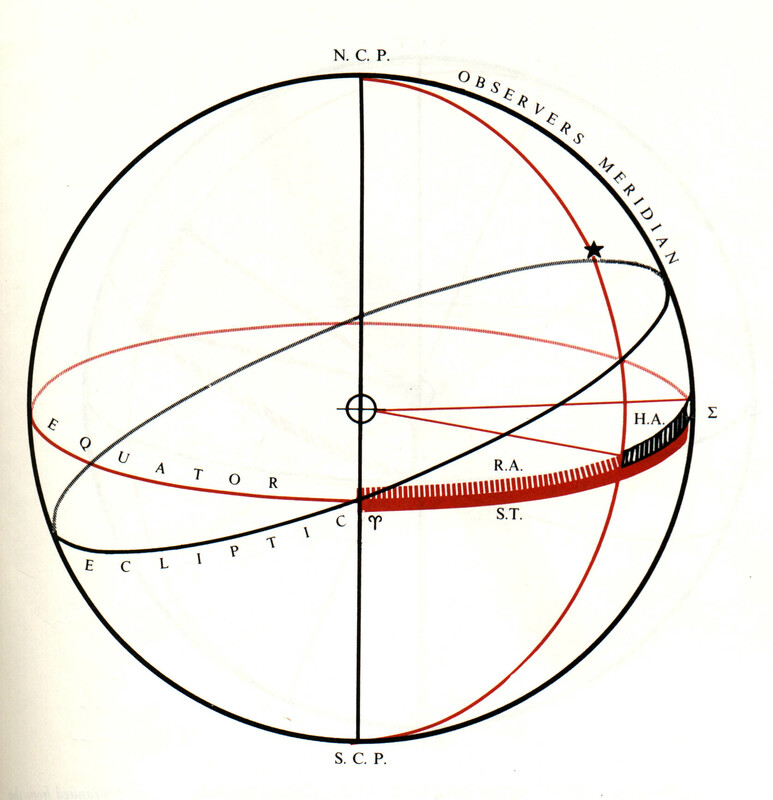 A century ago was done with a special purpose telescope which can point only at the meridian. Refraction -- light gets bent (refracted) by the Earth's atmosphere, a star's altitude is increased by refraction. When the Sun is setting, it is actually beneath the horizon when its lower limb just appears to touch the horizon -- in other words, the refraction amounts to ~35', the apparent diameter of the Sun. Refraction depends on your altitude, the atmospheric conditions, and the wavelength of the observation. By making accurate position measurements, we have discovered a number of interesting effects such as precession which is caused by the torque of the moon on the Earth. The direction that the Earth's polar axis is pointing in space is slowly changing and describes a circle on the sky (and it takes the polar direction 26,000 years to travel this circle once). The location of the Vernal Equinox shifts by 50" per year. Precession also means that positions of astronomical objects are tabulated for a stated time such as 2000.0 meaning the beginning of 2000 and need to be corrected for the date when you will be observing. Eclipses occur when the Earth, Sun, and Moon lie along a line such that either the shadow of the Earth falls on the Moon (lunar eclipse) or the Moon's shadow falls on the Earth (solar eclipse). Note that lunar eclipses can only occur at full moon and conversely, solar eclipses can occur only at new moon. Why don't eclipses occur every month? Because the Moon's orbit is tilted by 5º with respect to the the ecliptic plane. 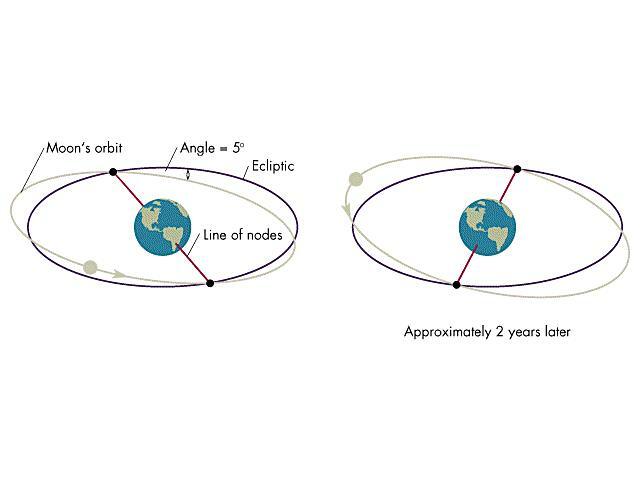 The line connecting the two intersection points between the Moon's orbit and the ecliptic plane is called the line of nodes. Only when the line of nodes is pointing towards the Sun can eclipses occur. The calendar time of this "eclipse season" slowly changes because of gravitational forces exerted by the Sun on the Moon. The direction of the line of nodes makes a complete 360º circuit in 18.6 years (called the Saros cycle). The existence of solar eclipses is a lucky happenstance -- the apparent diameters of the Sun and Moon are nearly equal. Because the Moon's orbit around the Earth is an ellipse, the apparent size of the Moon varies during a month. If a solar eclipse occurs when the Moon is at a distant part of its orbit, it will be too small to cover the disk of the Sun fully and an annular eclipse occurs. The Moon's orbit is slowly increasing in size so someday there will be no total solar eclipses.